Are you looking for a new slim trash can that fits your bathroom’s style? We’ve taken a look at some of the market’s most popular and efficient trash cans and weighed up the pros and cons between each of them in order to help you properly decide which product suits your needs better. There are different attributes that change depending on the trash can, so it might be wise to set yourself a maximum budget before going for a new can, as some of the options out there are pretty expensive. We also advise you to thoroughly read our whole review before making a final decision – like we always say, some options are generally better than others, but you may think otherwise! 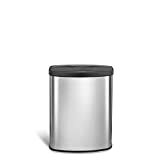 We do believe the Butterfly Step Trash Can by simplehuman seems to have an edge when compared to other products, though. Lifespan: Constant exposure to bathroom-specific trash could weaken and damage some low-quality products very easily. It is important to find a trash can that can work well for a long time without presenting signs of damage too early on in their lifespan. Odor retention: Probably the most important feature for a bathroom trash can, how well it manages to retain smell will ultimately design whether you like the product or not. A poorly designed trashcan will let bad smells leak, which will most certainly annoy anyone inside the bathroom or even on its surroundings. Removable inner bucket: This feature could easily be, after odor retention, the most sought after attribute available in a trashcan. For a bathroom trash can this is especially true, as not having to expose your hands to whatever lies inside the bucket is very important. 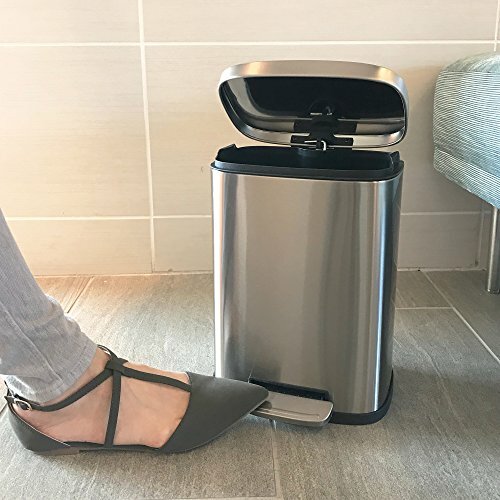 This bathroom trash can by iTouchless is fingerprint-proof and seems to be made of very high-quality stainless steel, and it offers its owners an easy-to-use pedal that doesn’t require much strength to operate. There seems to be a recurrent issue with this product as sometimes the lid will not properly shut, but in general, this shouldn’t really happen – if it does, contact the seller and they’ll gladly help you out. This last sentence is also something you might like to consider. The seller’s customer service is very good and they will help you out by sending replacement parts if anything breaks apart. The product doesn’t occupy much space and it’s ideal to keep in a bathroom – even if your is relatively small. The material and design also do the price some justice as the trashcan is well made, even though the price might seem a bit too much at first glance. iTouchless has been in business for over 20 years and makes other automatic hygienic bathroom accessories like hands-free soap and shampoo dispensers. Modern design fits almost every taste. The size is ideal for a bathroom and the seller also offers other trash cans made with the same style but in a bigger size. Quality material makes your trashcan impervious to fingerprint marks. Could be too expensive at first glance, considering its simplicity. The lid could fail after some time of usage. This video is for the much larger 50-liter trash can from iTouchless, but you may want to check it out to get a better idea of the functionality since the “Soft-Step” mechanism is essentially the same on the two models. 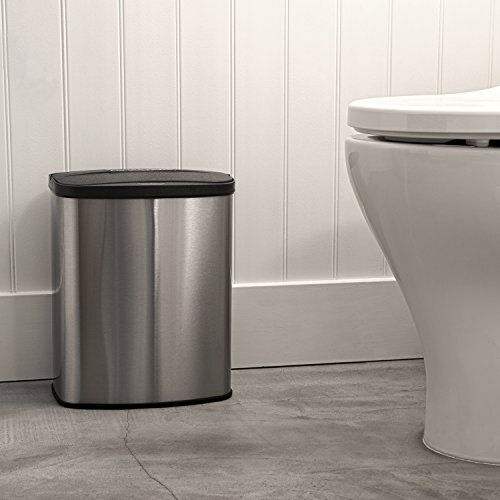 This simplehuman trash can is one among many of the company’s products, but it definitely feels like one of the better choices out there, especially for use in the bathroom. The lid doors open sideways and allow easier recollection of whatever’s inside, and the pedal looks very sturdy and should last for a long time. The product also offers a big container without feeling like a huge trash can on its own, and it’s ideal to place on a bathroom. The design is very classy and should fit most tight spaces given its thin surface – definitely one to get if you want to ensure a quality purchase. Simple human is a well-known brand, especially for quality trash cans. They also came out on top in our reviews of the best wall-mounted soap and shampoo dispenser for their functional design and build quality. Solid design made with top-quality material offers both quality and a long lifespan. Closes and opens smoothly without making too much noise. Has a lot of room to store trash before having to take out the bag, and when you take it out the process is very straightforward. The bag doesn’t show on the outside of the trashcan, unlike other products. The packaging seems pretty cheap and the product could be damaged when sent. It can be damaged easily – be aware of not dropping anything on top of it or it could dent. This automatic bathroom trashcan by Ninestars opens on its own, which makes it an ideal bathroom commodity. It does require a couple of D-sized batteries, which are not included with your purchase. It might be best for you to purchase rechargeable batteries too, as it will save you a lot of money in the long run. The system it has is very practical and it should work with most standard-sized bags. The trashcan could feel a bit too small at times, but if you buy it strictly for your bathroom you are likely to be pleased with your purchase. As soon as the infrared sensor detects your hand’s movement, it will open up. It is made from stainless steel but it does have some plastic parts which could be made of higher-quality products, but the price seems very good for such a modern commodity. The infrared system makes this trashcan an ideal product to have in your bathroom. Doesn’t cost a fortune, unlike other technology-rich products. Ideal if you live on your own as it retains enough trash to last for over a couple of days. Could be a bit too small for some bathrooms, especially large families- may need to be emptied often. The plastic ends aren’t made of high-quality materials. You may want to invest in rechargeable batteries. 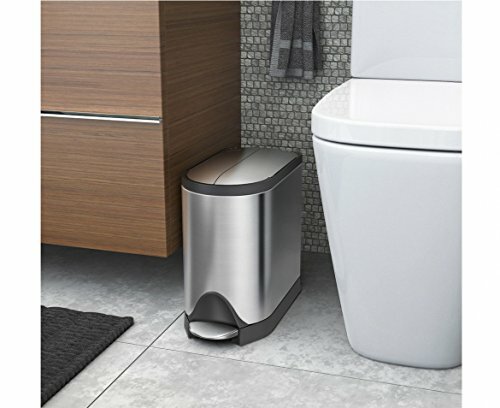 Although a bit expensive, the Butterfly Step Trash Can by simplehuman has so many positive features that it’s simply not possible to overlook. The features it offers definitely put it a step above the other products we’ve reviewed and may be among the best on the market – but that’s for you to judge! If you’re currently throwing out pet waste (doggie poop bags and kitty litter) in your bathroom trash can, you may want to check out our article on why that is a bad idea for health reasons and check out several good trash cans for dog poop and kitty litter.